The 50 metre motor yacht Ipanema has been listed for sale by Jean-Marie Recamier and Fernando Nicholson at Camper & Nicholsons. 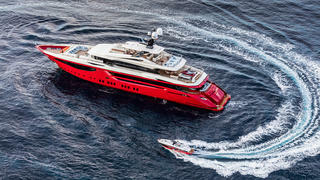 Built in aluminium by Italian yard Mondomarine to a design by Hot Lab, she was delivered in 2016 and is ABS classed, MCA compliant and still under shipyard warranty. A lavish interior has flexible accommodation for up to 12 guests in five cabins consisting of a main-deck master suite, VIP suite, a double and two twins plus two Pullman berths, all with entertainment centres and en-suite bathroom facilities. In addition, there are quarters for 12 crew on this yacht for sale. Boasting full-height windows running the length of the main deck allowing ample daylight to flood in, her saloon features chintz sofas and armchairs, mirrored ceiling panels and high-gloss mahogany panelling throughout. More than a dozen types of marble are used, with several different themes created to separate the key areas on board. The main aft deck is large enough to store three Jet Skis and a relaxing al fresco dining area around a circular table, while the semi-covered sun deck comes with a large Jacuzzi, an outdoor bar and a selection of sun pads. Other features include a foredeck seating area and a large beach club giving easy access to the sea. Twin 2,575hp MTU diesel engines deliver a cruising speed of 15 knots and a transatlantic range of 3,500 nautical miles. Ipanema is asking €25 million.